James age 55 - Father of Joseph? 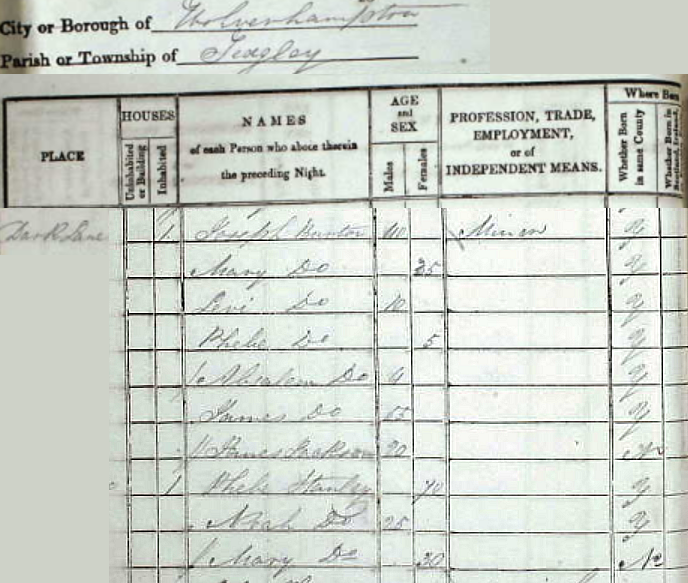 It is always worth looking at the others on a census page - families often lived in close proximity - it allowed support in hard times and when children were born to a family. Mary Stanley age 30 (Phebe Stanley's daughter-in-law?) - As she was not born in this county it is probable that she is a Stanley by marriage. The family is living at 58 Cinder Hill, Ettingshall. Joseph, age 55, is a miner. His wife Mary is 48 and thier son, Absalom is a labourer in the iron works. Mary Ann Clifford is listed as a granddaughter. The opinions and ideas on here are my own, but no man is a island - no woman either - therefore I have referred to work by others. No copyright infringement is intended in any of the material I have uploaded onto my site. Please contact me if I have failed to acknowledge any of your work and I will rectify the situation or remove the offending material..